London Ladd's mural of Martin Luther King, Jr. is under the railroad bridge that crosses S. Salina St. just outside of downtown. London Ladd would like to paint something on the actual railroad bridge. He says the surface was prepared for a previous artist who could not finish. 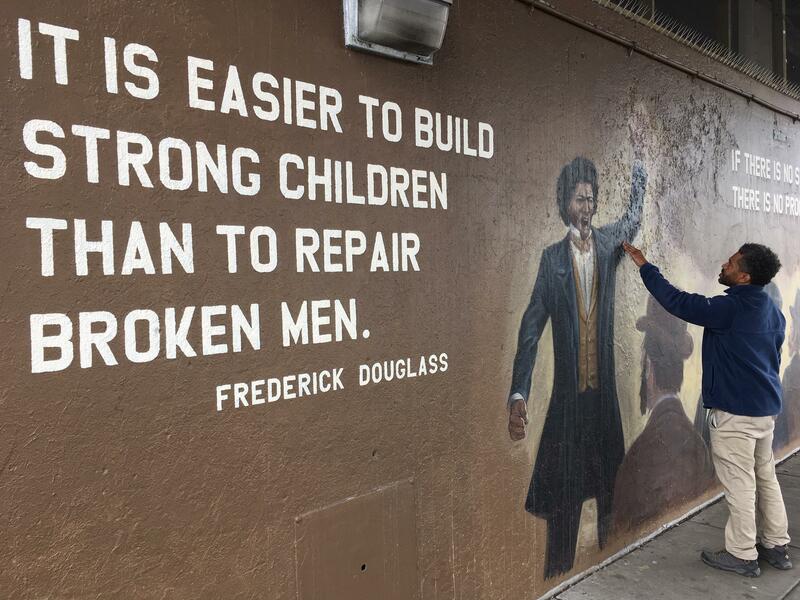 Ladd checks the condition of the Frederick Douglass mural. One of the stops on my tour with Kate Auwaerter was to see "The Grazers." Parking meters appear to be grazing on the tree near Prince of Peace church on E. Jefferson St.
"One, Two, Three" by SU alumnus Sol LeWitt sits behind the federal building. It was installed as part of a federal government's art and architecture program which requires a certain percentage of new construction go to art. LeWitt died in 2007 at 78. The "modular sculpture" as LeWitt called it is minimalist, but also complex, with different views from every side. It's also intended to reference the federal building. The sculpture, installed in 1979, is intended to interact with sunlight. Cubes become triangles in this shadow. The piece is by a well-known artist, but not the best known due to it's location. "The Hand" was made of reclaimed steel, wood, and concrete over one weekend by Brendan Rose in 2009. People have knitted gloves for the hand in the winter. Like LeWitt's piece, "Immersive Cloud" is also intended to interact with sunlight. The reflective disks mirror trees, the sky, buildings, and people's faces. It's at the corner of S. Townsend and E. Genesee. 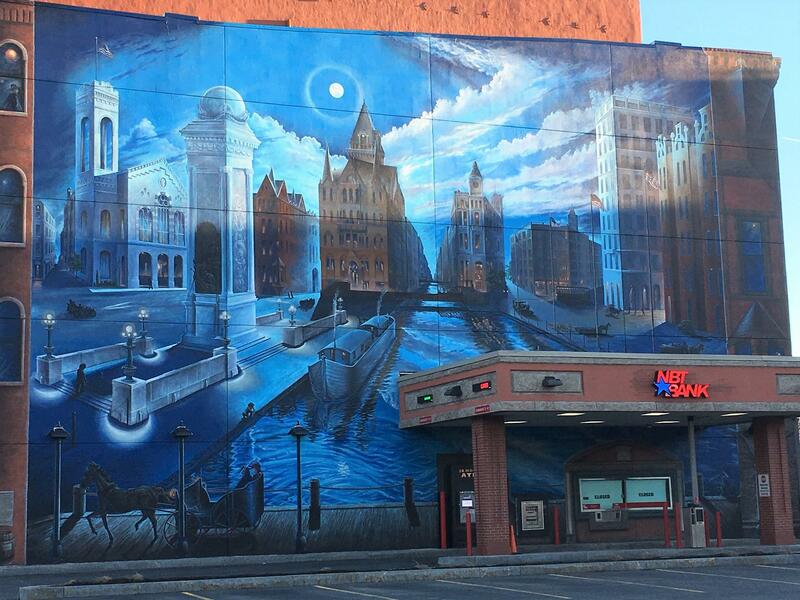 Many Syracuse area residents have probably noticed some form of public art around the community, especially downtown...a mural here, a sculpture there, or even posters by local artists in empty storefront windows. 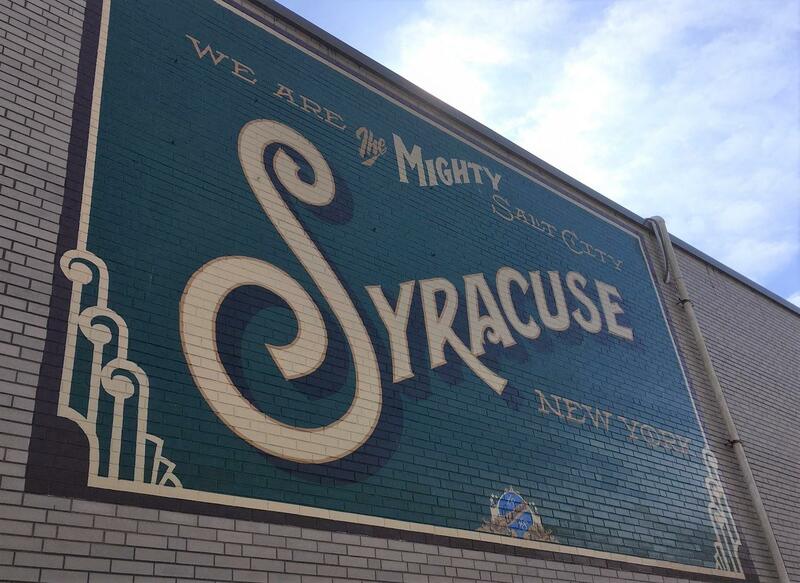 WAER's Scott Willis explores the greater impact of Syracuse's public art. 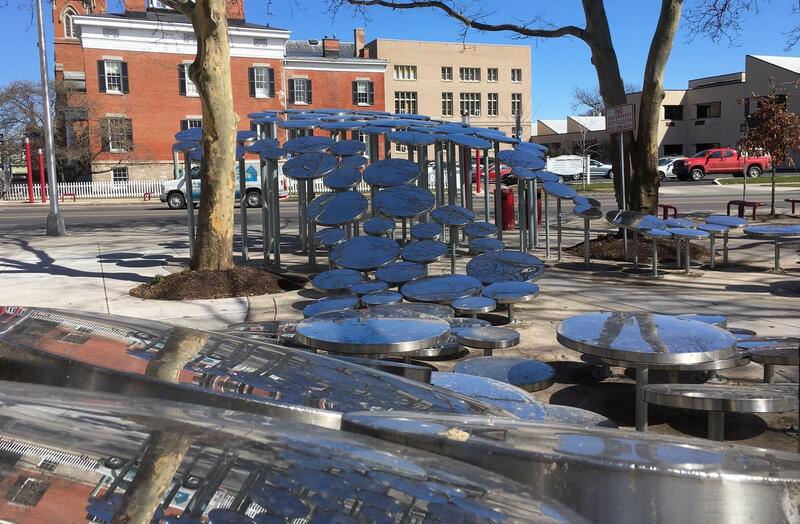 It might be nice to look at, but what is the value of public art to the larger community? One way to find out is by taking a walking tour of some downtown art. "Clinton Serenade" is probably most visible from I-690 eastbound. It's otherwise off the beaten path for pedestrians who have little reason to venture to that side of the building. The mural was painted by Corky Goss and Chip Miller in 2009. Goss’s work can also be seen on the Erie Canal museum. Auwaerter says art can play a role in everyone’s life. Executive Director of CNY Arts, Steve Butler says public art can invigorate a community. CNY Arts promotes and supports arts, individual artists, and cultural organizations through grants. Butler says funding comes from the state, the county, and sometimes the national endowment for the arts and private foundations. This bold mural is on 420 E. Genesee St. adjacent to Firefighters' Memorial Park. Kate Auwaerter says public art if for community members and visitors alike. For example, perhaps you’ve walked right by an installation by Leon Reed. It’s easy to miss. It’s on east Jefferson Street near Prince of Peace Church across from the county courthouses and is a piece Auwaerter holds dear. But what can the impact of smaller whimsical installations have, or that of larger pieces? Why should they be supported? Steve Butler with CNY Arts knows some question the value of art in all forms. Auwaerter points out something many people have probably seen from the car, but not on foot. It’s at East Genesee and South Townsend streets, kitty corner from Firefighters’ Memorial Park. "Immersive Cloud" sits on the corner of S. Townsend and E. Genesee St. It was commissioned by the Connective Corridor, and created by Daekwon Park, an assistant professor in SU's school of architecture. She says people have posted photos of their reflections on social media. That can be a powerful tool in raising awareness of a community’s public art and wanting to learn more. Chris Malone is Grants and Public Programming Associate at CNY Arts. If you’ve traveled South Salina Street just south of downtown since last summer, you’ve probably noticed murals on each concrete wall underneath the railroad bridge. It’s a unique example of public art that aims to do more than beautify the drab space. I caught up with artist London Ladd to talk about the value and meaning of his murals, and of public art in general. Artist London Ladd finds one of many water pockets that have formed beneath the surface of his Martin Luther King, Jr. mural. Eventually, they'll burst and leave pockmarks. He's disappointed that the preapared surface is not holding up better less than a year after he painted. We met near the bridge at the busy intersection of Salina and Taylor Streets, which also sees its share of pedestrian traffic. That’s the best way to take in the murals, which depict two important figures in African American history. On the west wall is Martin luther King Jr., and on the east, Frederick Douglass. “Douglass spoke here 12 times during his life; King spoke twice, so it matched. We used text to convey the message. Not just through the visual arts, but almost like a picture out of a picture book,” Ladd said. Ladd says public art can uplift a community. He says people passing through last summer seemed to have a little more pride. “I think public art is so important. When I go to other cities like Philadelphia, which is a beacon of public art and murals, you see the pride that they have in it. Or in Rochester, when you go to their arts district, you see these gorgeous murals, and it really elevates the area in the sense of pride and just being a hub of art. I believe art can be very therapeutic, it can be very emotive, it can be inspiring, in any neighborhood, whether it’s predominantly Polish, Irish, or mostly Muslim. You get public art that touches upon the historical impact of that area, or the predominant people of that region, it helps,” Ladd said. 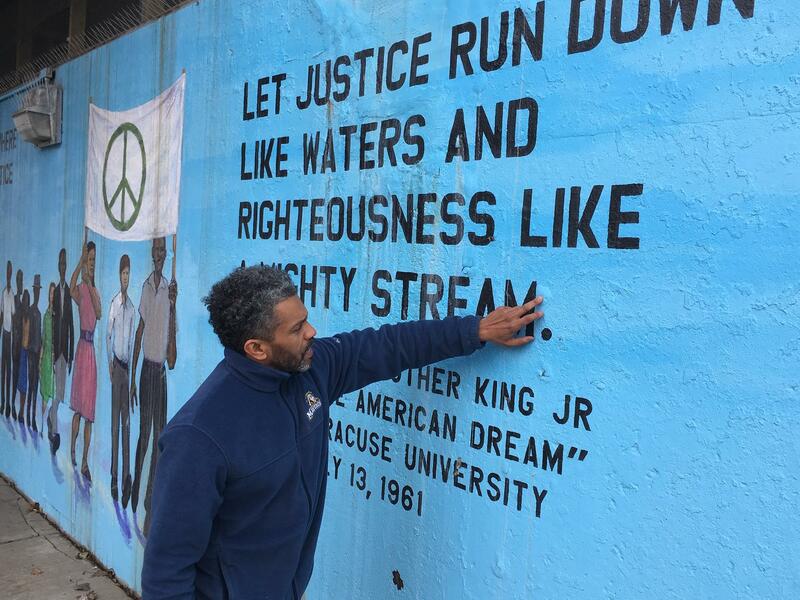 Ladd checks the condition of the Frederick Douglass mural. This one is holding up much better. So, what’s London Ladd's next project? He’d like to tackle the bridge itself. Ladd says there are still many details to be worked out with the city and the railroad before anything becomes final. If it doesn't work out, he says he’s at peace. While he’d like to continue doing public art, Ladd is also working with his daughter on a children's book. She has a degree in illustration, and Ladd says he’s only too proud she's following in his footsteps. He’s also nurturing ideas for his long-time desire to publish a graphic novel, which he says would be a nice bookend to his career. The City of Auburn is known for its rich history. But the arts scene has also been gaining momentum in recent years, and the state is taking notice by supporting the efforts with significant grants. In part one of our story, we hear how art and history literally come together, on the west end of the city. Explore Aurburn's growing arts scene with WAER's Scott Willis.